Sometimes you need to be honest with yourself. Are you really making progress towards your goals, or have you been spinning your wheels and not getting anywhere? I have be guilty of every single on of these reasons in the past and have let them hamper my progress. However, now I am getting better at identifying when one of the reasons is impacting my training, and then I can put measures in place to negate it. I have compiled the top five reasons you're not making progress to help you identify and combat them. Five: Not training hard enough. You need to be training at a certain level to allow your strength, size and speed to progress. Even fat loss can’t occur if you’re training isn’t sufficient – because energy output is a key consideration for creating an energy deficit. Now you don’t need to train to exhaustion or run out and buy a ‘no pain, no gain’ T-shirt. 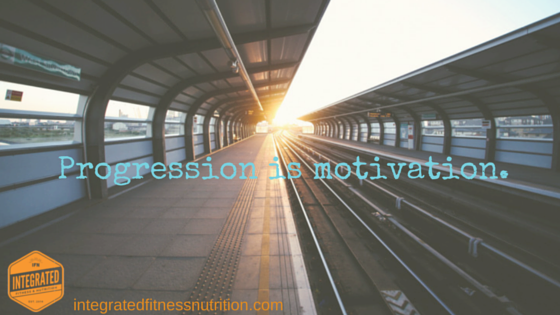 All you need to do is push yourself to the correct level on each exercise and aim for continual progress. If you can do ten reps with 60kg on the bench press this week, why not try 65kg next week. You might only get eight reps, but try again next week and continue to build! This all comes down to attitude. If you want to be in the gym and make progress towards your goal, there will be no issue pushing yourself and training hard. However, if you feel you 'have to go to the gym' but have no real reason or purpose, it's difficult to train with any intensity. I know you won't be 'in the zone' every time you train, but if you can improve the quality of your 'average sessions' and maintain intensity, your progress will skyrocket! Technology has changed the world and we now have seemingly instant - or next day delivery (with free shipping) - access to anything we decide we want. Despite this, the human body and the way it adapts to exercise and new stimulus has remained the same. When people start a new program they often make great progress from the beginner to pre-intermediate stage. After this early rush of gains, the progress slows (note: doesn't stop). Many people don't like this decreased rate of progression, so they start a new program to chase that faster progress. This is akin to completing the first semester of eight different university degrees. Sure, you pick up the basics quickly and might be OK at some things - but you will never become an expert. Also just like university, it's expensive.. The idea that you need a new program every six weeks was probably invented by personal trainers, to get more clients. Sure, change a few variables, but you don’t overhaul the whole thing. Most people would do better with a week off and then getting back into the same program again and just increasing the loading! Stick to the plan and let it works it magic. Weight loss, muscle gain and strength development aren't linear. You will go through phases of rapid progression and then sometimes it will slow. If you tough it out, you will get the continual progress that you miss out on by swapping plans! Three: Not having a program. If you don’t have a program, what are you doing at the gym? Each workout tends to become a session of doing whatever is available, and it is very easy to cut it short. Now this is fine if you’re goal is to burn some energy and take 45 minutes out of your day, but if you want to build a better physique or optimise your progress, you need to get a plan. The plan doesn’t have to be written by a coach. Sure that would help, but you can do some research and put together your own program to get you started. There are tonnes of strength training programs out there that you can follow - try 5/3/1 or Stronglifts to get you started. However, these programs are for building strength. If they don't work for you, it doesn't mean the program is not good, it means the program was not good for you! Get a plan - any play - and stick to it! Want to gain more tips on how to make more progress at the gym? We will be in your inbox with some great content in the near future! There is nothing worse than seeing people making an effort to train hard and eat well some of the time, and then undo their good work at others. The cruelest part is that people often only remember all the hard work they are doing, and can't understand why they aren't getting results. They remember how they cooked all their meals last week and went to the gym five times - just like they had planned. They forget how they only went to the gym once this week and haven't had cooked any of their meals. That's just human nature - we are more likely to remember spending 1 hour preparing meals for the week, compared to remembering that quick trip through the drive through after work. Now I don't believe in excuses, I believe in reasons. If you are super busy and couldn't get to the gym one day, that is a reason you didn't train, not an excuse. The problem with excuses is that they allow people to disown or distance themselves from the issue. Now let's say you are super busy for an entire month and you gain 3kg. Your excuse for not training is that you were so busy. However, the reason that you put on weight is because you didn't train. If you let an excuse distance yourself from the weight gain, it becomes very hard to get motivated to do anything about - because it wasn't your fault. If you accept that there was a reason it happened, own it, and then move on by getting back into the gym routine - you will lose the weight in no time! One: Not having a goal. If you don’t have a goal, you can’t program towards anything. If you don’t have a goal, there is no program that you can be consistently sticking too. Goal setting can be quite simple, you need to pick something you want to work towards. The S.M.A.R.T rules (Google it) are useful, but for most people, they just need to sit down and pick what they would like to do. My main suggestion is that you be clear on what you want to achieve, and be honest. I often hear from guys wanting to gain muscle that they want to ‘gain muscle – but not get too huge.’ Now this is fine, they want to get a fit-looking physique – as opposed to the bodybuilding mass look. However, the way it is worded is what I don’t like. A better goal would be to ‘gain 3kg muscle and have abs’. This means they gain the muscle they want, without gaining fat tissue. This is a better reflection of what they want to achieve, compared to the original statement. Here are my current goals, where I have tried to be stronger in terms of setting what I want to achieve in the gym (which hasn't always been a strong point). I am currently training to improve my strength and maintain body composition (ie. not get fat trying to get strong). My specific goals are Deadlift 2.5x bodyweight, Squat 2.0 x bodyweight, Bench Press 1.5 x bodyweight and Overhead Press 1.0 x bodyweight. Now these strength goals are good for me, because they have exact numbers that I can hit. Maintaining body composition also remains important, because they targets are weight-dependant. If I put on 10kg of fat because I get lazy on my diet while trying to get strong, it will add another 25kg onto my deadlift goal! If you want to learn more about your current fitness and nutrition status, you can sign up for the Integrated Fitness & Nutrition Tracking Challenge for free!